Shared Web Hosting is most popular and most affordable type of Web Hosting. It means that your website shares resources with other websites on the same server. That means you also share costs, and thats the reason why Shared Web Hosting is so pupular with Beginners. Shared Web Hosting includes administration of the server, installation of operation system and programs. It includes updating of programs, scripts and protection from security threats. In short, you have nothing to worry about, because everything is taken care of. You can calmly use your hosting account. Shared Web Hosting should include support, but that depends on each hosting provider. Good Hosts provide extensive Knowledge Base, Forums, Free Online Chat, Email Support and more. To provide all that they need dedicated people, who like what they do. And that means costs. That`s why hosts with good support have higher prices than the ones with poor, on no support at all. Many people complain about bad support, but they don`t realize that quality services cost money. You honestly can`t expect support from a cheap provider. Core of the service is your hosting space, bandwidth, emails and other features that are controlled in a web-based environment called Control Panel. There are many types of Control Panels. They might differ by look, but they all share one common thing: They are used to control your hosting account. Most popular Control Panels on shared hosting accounts are cPanel, Plesk and Vdeck. Main advantage of shared hosting is surely price, since costs of managing Web Server are divided among many users. That makes shared hosting very popular Beginner Hosting option who don`t want to spend a fortune for hosting. Second advantage is that using a shared hosting is very easy and does not require a long learning curve. Good (not the cheapest) shared hosts offer excellent support, which is essential for beginners to have a positive hosting experience. I recommend not to evaluate your host only by price. Sharing good things also means sharing bad things. Since all sites are on the same server, sites divide bandwidth and resources. If one site uses too much resources that means less resources for others. But since your site wont be receiving thousands of hits per second that shouldn`t be a problem. Shared Web Hosting is great for Beginners, because of small running costs opportunity to host your own website, while learning a lot of exciting things. For E-commerce or larger sites Virtual Private Server or Dedicated Hosting would be better. Web Hosting is a Business, where a company (Web Host) offers Web space and other services for a small fee. They provide environment (hardware, software, knowledge and support) for hosting web pages. Websites that you visit on Internet, are located on computers called Web Servers. They have a single task: They serve Web Pages. Web Servers can run on Linux or Windows, and can host from 1 to hundreds of Web Sites. These Servers are located in data centers, which are exclusively built for hosting purposes. Data Centers are monitored and managed 24/7 by IT professionals, that take care everything runs smoothly. While larger companies operate their own data centers, smaller rent resources from the first ones to minimize costs. One of the biggest Data Centers in the world, is located at ThePlanet . 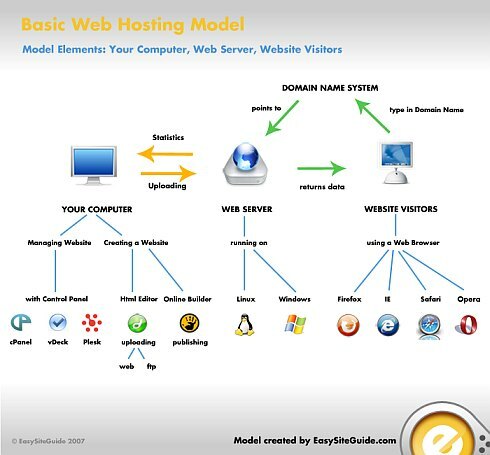 EasySiteGuide.com is hosted on HostGator, who uses ThePlanets data center. The Planet Data Center Chart (PDF document, 98 Kb). What does hosting a website include? Web Hosting Companies require that you have your own domain name in order the hosting to work. Are all Hosting types the same? No, there are many types of web hosting. Beginners usually try to find a free hosting provider, but after some time, they decide to go for a Shared Hosting Account, which is most popular and the most affordable. Other hosting types are Virtual Private Hosting, Dedicated Hosting and Colocation. You can read more about them in our article: Hosting types Explained. How can I obtain Web Hosting for my first website? It is very simple and it takes only a few minutes. Most companies allow you to pay with Credit Card or even Paypal. You register a domain name, select a hosting plan and provide them with email and your details. When the process is completed they will instantly send you an email with your account details. 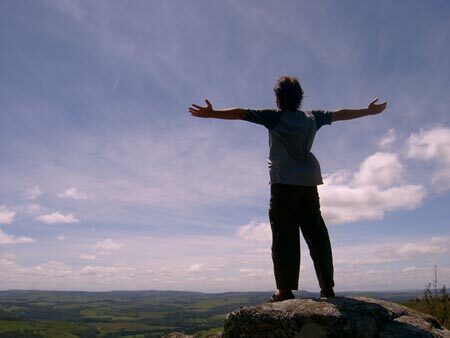 Sitesell.com is a website that changes peoples lives. It is the home of Site Build It!, E commerce program that enables beginners to start online business the right way. It`s a all in one package of hosting, building, marketing and software tools that delivers. To tell you the truth, it OVERdelivers! Show proof that SBI! works! Who will benefit the most from Site Build it? Beginners, who want to make money on internet, and existing website owners, who are disappointed with their income, and did not find their path to success. Why is Site Build it different? It works. It works and it works! And not just for a few people. It works for all of us. SBI sites succeed because SBI provides the knowledge, tools and guidance. And it provides it as long as you need it – so you will succeed! Check their website for objective proofs and Compare SBI! with other Web hosts. Is Site Build It only for computer geeks? No. Site Build It was built to be used by people who had never created a website before, but are prepared to learn and what is most important, invest their time and action in their success! Sitesell.com has been online since 1998, they have Alexa rank of about 550 – that means they are among the most reputable websites on the planet, along with ibm.com and many others. They have a strong online community of satisfied customers, who all succeeded or are on their way to success. They have a money back guarantee, and they do refund the money if you are not satisfied, but that rarely happens. You will Discover why Webmasters love SBI!. If you haven`t done it yet, Once your site gets approved you can insert Adsense code into your site. We will now configure the way your Adsense code will look on your website. You can customize the way ads will look on your site to either blend them with your content or stand out. Once in the sytem click on Adsense Setup. SPECIAL AD TYPES – these are special types that promote different products. Adsense Ad Formats can be seen here. Adsense allows you to select colors from premade templates or create your own. What color palletes are the most successful? This is an advanced option for larger sites that want more control. This refers to where in your page ads will take place. Different sites, different placements. But here are some common placements that Google suggests . Copy/Paste your Adsense code exactly as appears in the box. Very important: No matter how tempting, DO NOT click on your own ads. Google strictly prohibits it and you can get your account canceled if you do it. It is hard to maintain true family bonds in today fast life style. But thanks to technology you can share your precious moments with the ones you love. Instead of waiting business to come your way, create a website that promotes the best thing in the world – YOURSELF! Its bold, its different and its effective! You will stand out of thousands if you have the courage to do it. I always dreamed about a different life, different job that won`t be a 9 to 5 one. People were laughing at me, but look who is laughing now. I love creating my website and I am starting to feel financial freedom as I am writing this. You can do it too!